An energy bill passed the House of Representatives with an amendment that repeals the EPA’s new residential wood heater regulations. The bill is not likely to pass the Senate and President Obama vowed to veto it, if it comes to his desk. The 2016 passage of a bill that includes repealing the EPA’s residential wood heater regulations came as a surprise to most in the hearth industry, as well as in relevant state and federal agencies. The underlying bill, H.R. 1986, dubbed “the Stop EPA Overregulation of Rural Americans,” had 29 Republicans and no Democrat co-sponsors. The sponsors of the bill are almost all from very rural parts of the country but members of Congress representing districts with the highest levels of wood heating did not co-sponsor the bill. Most of the sponsors come from the southern half of the United States and likely reflect their deep-seated opposition to the EPA regulations generally. Some of the sponsors of the bill refer to a “War on Rural America.” One of the most vocal advocates for the bill, Congressman Jason Smith (R-MO-8) repeatedly says the EPA is regulating existing stoves, not just new ones. He said in a statement that there are 12 million stoves in 2.4 million homes, probably referring to the distinction between the estimated total of 12 million stoves and the 2.4 million homes that use wood or pellets as a primary heating source. None of the industry groups representing sectors of the hearth industry, including Hearth, Patio & Barbecue Association (HPBA), Biomass Thermal Energy Council (BTEC), and Pellet Fuels Institute (PFI), supported H.R. 1986, and it is unclear if any major company in the hearth industry supported the bill. One small Michigan company, Eco-Fab Industries that makes Eco-Maxx outdoor wood stoves which do not meet EPA emission regulations and cannot be sold in the residential market after Jan. 1, 2016, supports the bill. Hearth industry leaders indicate that they are vested in broad parts of the NSPS and think that a judicial challenge to certain parts is the best strategy for the solution they want. 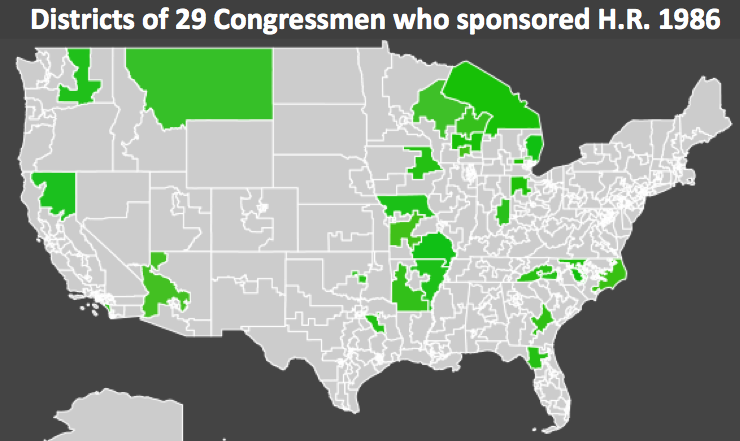 HPBA had mounted a legislative push in 2014, urging members of Congress to sponsor H.R. 4407 that would have prohibited the EPA from setting emission regulations lower than 4.5 grams per hour. (See AGH analysis of H.R. 4407) Some of the members who supported H.R. 4407 became co-sponsors of H.R. 1986. "Thousands of hard working industry, non-profit and agency experts put years of work into these regulations and they are truly a compromise of competing interests," said John Ackerly, President of the Alliance for Green Heat. "If no major stakeholder group is supporting the repeal of the regulations, why is the House of Representatives voting to do that?" Ackerly added. The EPA issued its long-awaited voluntary hangtag, which will help consumers identify the cleanest and most efficient burning wood and pellet heaters on the market. Manufacturers who make stoves and boilers that already meet the stricter 2020 emissions standards can use the hangtag. The hangtag is a major step towards a “green” or “eco-label” for wood and pellet stoves for designating those stoves that emitted the least amount of smoke in the test lab. The efficiency of the stove must also be disclosed on the hangtag, which is usually more important information for consumers than emissions. To date, there are three Lopi stoves that bear the hangtag - the Cape Cod Hybrid Fyre, the Flushwood Insert Hybrid Fyre and the Small Flushwood Hybrid Fyre, and a number of Blaze King stoves, the Katydid and four Garn Boilers. 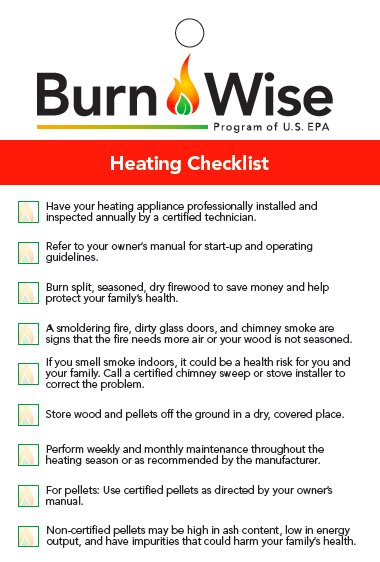 The Alliance urges consumers to consider buying stoves that bear this label or that at least ones that disclose their actual efficiency on the list of EPA certified stoves. Most European countries have had eco-labels for stoves for many years that have helped drive the market to exceed the minimum emission and efficiency standards. 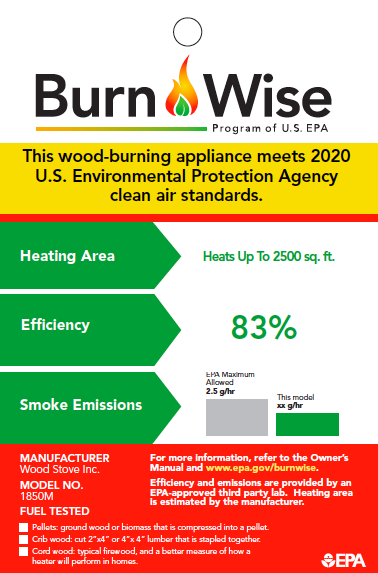 The EPA designed this hangtag “to provide an incentive to manufacturers to meet the federal 2020 standards early” but the main industry stove association, the Hearth, Patio & Barbecue Association (HPBA) is suing the EPA to prevent those stricter 2020 standards from taking effect. It is still too early to tell if the big stove manufacturers may decline to use the hangtag because they may view it as a step toward the 2020 standards. Some companies are already taking steps to display the hangtag. 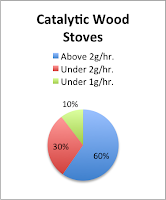 The current emission standard for wood and pellet stoves is 4.5 grams per hour and the more stringent 2020 standard will be 2.0 grams per hour. There are 76 models of pellet stoves on the EPA’s list of certified stoves and 48 of them are already under the 2 grams per hour limit, so 63% of pellet stove models already meet these 2020 standards and are eligible to display the consumer hangtag. 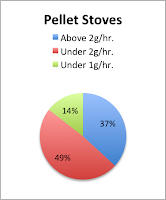 Eleven stoves, or 14% of all pellet stoves are already less than 1 gram per hour. Among EPA certified wood and pellet boilers and furnaces, there are 72 models on the market and 38 of them meet the 2020 emissions standards and can use the hangtag. Of those 38, only 5 of the models use cord wood achieve the 2020 standards but virtually all of the pellet units (33 out of 35) achieve the 2020 standards. Most of the certified pellet boilers are technologies imported from Europe and emit about one tenth of the emissions that certified cord wood boilers emit. estimated by the companies themselves, because BTU per hour claims have become too unreliable and prone to exaggeration. In the past, the EPA did not require that test labs use actual efficiency numbers in heat output calculations and test labs have used a range of efficiency estimates to make stoves look more powerful that they actually are. The hangtag also provides a box for companies to designate if they test with cordwood. For the first time ever, consumers can start to identify stoves that are designed and tested with the fuel that they will use. No stove has been certified with cordwood yet and the ASTM cordwood test method is still in progress, but several companies are expected to test with cordwood in coming months. The EPA is using the back of the hangtag to list important educational messages. Among those messages is the strongest endorsement yet of certified pellets, a move that may irritate some pellet manufacturers who have been resisting getting their pellets certified. The EPA says that “non-certified pellets may be high in ash content, low and energy output, and have impurities that could harm your families health.” While some cheaper pellets have high ash content, low heat output and possibly even contain impurities, the quality of many uncertified pellet brands are on par with those that are certified and some of the highest quality pellets are not certified. The EPA’s willingness to strongly endorse pellet certification comes at a time when the main certifying body, the Pellet Fuel Institute (PFI), is also suing the EPA over pellet certification issues. Among wood and pellet boilers, there are 72 models on the market and 38 of them meet the 2020 emissions standards and can use the hang-tag. Of those 38, only 5 of the models use cord wood achieve the 2020 standards and can use the hang-tag but virtually all of the pellet units (33 out of 35) achieve the 2020 standards. Most of the certified pellet boilers are technology imported from Europe and emit about one tenth of the emissions that the cord wood boilers emit. The success of the EPA’s consumer hangtag, like many eco labels, may hinge on branding and how recognizable the hangtag is to consumers. If the EPA, states, and non-profits put resources into promoting the hangtag, consumers will be more likely to ask for it and base their purchasing decisions on it. The first companies to start using the hangtag could see a boost in their sales and it could put pressure on the mainstream companies to use the hangtag, if they aren’t already. “This hangtag will help consumers not only choose cleaner stoves, but also to choose companies committed to making cleaner stoves and to releasing verified efficiency values to their consumers,” said John Ackerly, President of the Alliance for Green Heat. “If the stove you buy today already meets the 2020 standards, the parts and service for that stove are more likely to be available 5-10 years from now, when you need it,” Ackerly added. Visit the EPA's page on the voluntary hang-tag. For more on problems with EPA listings on Btu output per hour, the lack of disclosure of stove efficiencies, the EPA's 2020 emission standards for stoves and boilers and PFI pellet certification scheme. 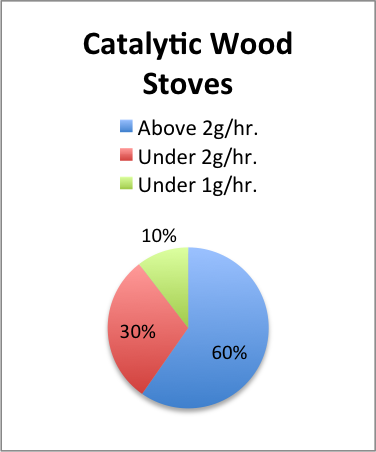 An independent assessment of popular pellet stoves conducted by the Alliance for Green Heat found that pellet stoves, unlike most wood stoves, can achieve low levels of emissions in real world settings that are in line with laboratory results. 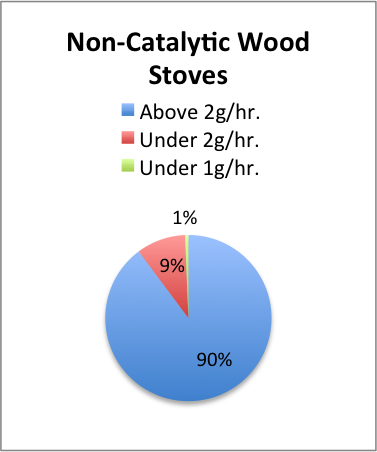 The Alliance for Green Heat ran a battery of tests on popular pellet stoves designed to approximate how they would perform in the real world. The group found that half of the stoves operated as clean at the end of the thirty-day test than they did at the beginning and the others were only slightly dirtier. All six stoves, from the least to the most expensive, operated well, and produced enough heat for a small to medium- sized home in most of the United States. One of the biggest differences was that the three more expensive stoves tested (above $4,000) needed very little weekly cleaning and maintenance. The less expensive stoves ($1,200 to $3,300) needed daily or at least bi-weekly cleaning of their burn pots and glass. The study also found a lack of accepted reporting standards, leading to exaggerated claims about efficiency, BTU output and pellet hopper size on manufacturer websites and promotional literature. The Alliance for Green Heat tested the stoves to give consumers better tools and make better purchasing decisions. The study is part of a yearlong Pellet Stove Design Challenge that assesses the state of existing pellet stove technologies. The Design Challenge will culminate in a competition for the cleanest and most efficient stoves, modeled after the Department of Energy’s Solar Decathlon. Approximately one million American homes are heated with pellet stoves, more than twice the number that have solar panels. In Italy alone, 2 million households heat with pellets. Pellet stoves often serve as primary heat sources, enabling homes to eliminate or drastically reduce fossil heating fuel. Last year, about 40,000 pellet stoves were sold in the U.S. and they may outsell wood stoves in the near future. The Alliance tested the England Stove Works 25-PDCVC, the Enviro M55 insert, the Harman Accentra 52i insert, the Piazzetta Sabrina, the Quadra-Fire Mt. Vernon AE, and the Ravelli RV80. The group assessed each stove on its cleanliness, efficiency, maintenance, heat output and visibility of glass. The overall winner was the Quadra-Fire Mt. Vernon AE, which received top marks in three of the five categories. The Harman Accentra received top marks in two of the five categories. The results of this study underscore that pellet stoves tend to burn substantially cleaner than wood stoves in real world settings, but it challenges the notion that pellet stoves generally have higher efficiencies than wood stoves. The efficiencies of the six stoves were low to medium, which is partially the result of companies not having to test and report actual efficiency numbers. “Our testing confirmed that pellet stoves are an effective and affordable renewable energy technology,” said John Ackerly, President of the Alliance for Green Heat. “We hoped to see higher efficiencies, but efficiencies should improve in coming years,” Ackerly added. Click here to read the full report on our website. Click here to download a PDF of the report (the PDF does not have all the links and photos that the online version has). Click here to download a PDF of the background materials to the report. The Alliance for Green Heat promotes modern wood and pellet heat as a low-carbon, sustainable and affordable residential energy solution. The Alliance works to advance cleaner and more efficient wood heating appliances and focuses on low and middle-income families. Founded in 2009, the Alliance is a 510(c)(3) non-profit organization based in Maryland.